New version of Speaking Email hits the app store! Black Friday 50% off annual subscription! Research from by digital agency Stone Temple shows Siri was able to answer only one in five questions asked of it. And they weren’t trying to trick it either. They tried out 5000 questions (including general knowledge and some standard tasks like reminders) on all the leading digital assistants and they all did poorly, but Siri did the worst. I notice they didn’t ask any of these assistants to read email. Bearing in mind email is the number one activity smartphones are used for, this seems to be missing. It is unrealistic to expect a general assistant to be able to do everything. Digital assistants are generally best for single answer questions, rather than engaging in an activity. 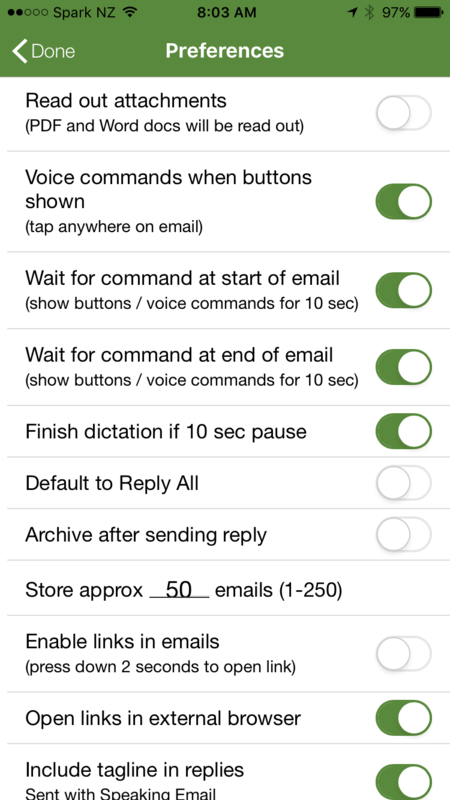 This is where our voice controlled email reading app Speaking Email has an edge. It addresses this shortcoming. It is a dedicated app for doing just email reading. Its smarts are around detecting email signatures, disclaimers, reply threads you have seen, and other clutter, and surfacing the important content. It has voice commands to archive, flag, trash, reply by dictation and forward. It doesn’t attempt to answer 5000 random questions, and it doesn’t have to, so it can focus on being good at helping you get through your backlog of emails. Activity-dedicated voice apps make sense. The general assistants are creating the demand – consumers (and businesses) are wanting to use smart voice technology. But the assistants are stumbling, not having the smarts to engage in involved activities, and this is where Speaking Email shines. Earlier this month as we were grilled by the NZ Hi Tech Awards judges one of the judges queries whether the app is truly “hands-free”. It’s hands-free for listening to email but until recently you needed your hands if you wanted to interact with your mail. We’ve released several new features recently that now make it possible to do email completely hands-free – including replying, forwarding, flagging, archiving or trashing. Now that we’ve got voice commands working nicely, we figured it would be easy to have Speaking Email listen for commands at the end of each email. Indeed, it was easy and it’s a great new feature, making it fully hands-free to interact with your email. You can also have it wait for a command at the start of the email, after the headers – say “play” or “continue” or wait 10 seconds for it to carry on as usual and play the email body. You can now use steering wheel / headset controls – next, previous and pause hardware buttons over Bluetooth or on your headphones (while technically this isn’t “hands free”, you don’t touch the phone!). We support skip next & previous email, rewind and fast forward. If you hit the “pause” button on your steering wheel / headset, we’ve made it invoke command listening mode, so you can say any command – like “archive”, “trash” or “reply” to dictate a reply. This is released on iOS and coming soon to Android. We now fully support Bluetooth HFP, which means using the microphone and speakers over Bluetooth. We support Bluetooth A2DP mode also, using the device microphone and a Bluetooth speaker. When a new audio routing is detected, it displays on screen. Basic edition is free and premium subscribers pay a piddly $2 a month! It took a while to get this right: we tried two other voice engines before picking Apple and Google. On iOS we are using the newly opened up iOS voice recogniser that is part of Siri. On Android we use the built-in Google voice recognition. We chose these because of their wide range of regional accents and languages, low battery usage, and offline usage. Most importantly we tried them and they worked pretty nicely. Personally, I was skeptical about how useful voice would be. These features took a while to come to fruition because we wanted to do it well or not at all. Given the experiences I’ve had using software like Siri, Talkler, and trying out other voice assistants, I thought voice would be annoying to use. If Siri mishears a command it just says “I didn’t understand that” and stops. No chance to try again. We’ve tried to address these sort of issues. I’ll give you a rundown of how it works. Tap anywhere to see the command buttons. Then either tap a button or you can say its name, like “trash”. You can say any of the labels on the buttons: “archive”, “trash”, “ignore”, “flag”, “repeat”, “reply”, “forward”, “play”. This makes it very easy to remember what you can say and when. For the “forward” command, a list of your preset forwarding recipients is shown. You can say the first word of the email address to select the person to send to. For example for “mike.nelson@beweb.co.nz” say “mike”. Anywhere you can say a command you can say “help” to find out what you can say, or “stop” to stop listening. Speaking Email dictation keeps listening as long as the operating system will allow – on iOS this is two minutes and it’s ok if you pause for breath during this time. At this time on Android unfortunately a pause of a couple of seconds will stop the dictation (so you need to speak without pausing). When you tap “done” or pause for 10 seconds (2 seconds on Android) Speaking Email repeats back what it thinks you said so you can change it before sending. You can say “redo”, “send”, “cancel” or “more” to add more. If you say “send” or “cancel” it carries on reading your next email to you without further ado. In dictation, Speaking Email uses voice recognition in the language set in your operating system settings. In case this is not what you expect, it’s shown on screen. If you have any problems with the recognition, check your system settings to make sure this language has voice recognition downloaded and available for offline use. And you know what? After my initial skepticism I now find the voice commands and dictation incredibly useful and don’t know how I got by without them! I absolutely love the app and being an outside sales rep in the car 4 to 6 hours a day find it incredibly helpful. It is literally freeing up and hour or two of time for me every day I am on the road by having a lot less time at the desk doing email. THANKS!!! We found sometimes the dictation engine would come out with something a little off beat that we hadn’t intended. So we decided to embrace that and added a light hearted disclaimer in our tagline. You can turn our tagline off in Preferences if you want to, and/or add your own signature. Last night Speaking Email was announced as a finalist in the Mobile category at the Hi Tech Awards finalists announcements at PwC in Auckland. This is quite a prestigious event so we are pretty stoked just to make the finals, especially considering the competition we were up against (http://www.hitech.org.nz/awards/finalists/year/2017). Speaking Email featured in NZBusiness Magazine. Recently Speaking Email has been published in NZBusiness magazine. Click here for the full article as a pdf. Beweb CEO Mike Nelson has built up an impressive client list over 16 years in the website business. He talks to NZBusiness about his Speaking Email app that’s caught the eye of one of the world’s biggest brands. NZB: What is your background prior to establishing beweb? MIKE: As a graduate I wanted to work in the up and coming ‘multimedia’ space, because in those days it sounded cool. So I picked Terabyte, the leader in the space, and went to the Computerworld conference in Wellington where they were presenting. Turns out they were looking for people, so they brought me to Auckland for an interview and I got a job. After a couple of years I left for my OE. In London my visa only allowed temporary work, which meant contracting and getting paid three times as much. Many ex-Terabyters went on to other jobs within the industry, which meant I had contacts and was able to start freelancing when I returned. Most good freelancers are hard to book, but I was always ready to fit things in and soon had enough work to take on another person. I asked former Terabyte colleague Jeremy Nicholls to join me. That’s how beweb started. NZB: What have been the main contributing factors to your business’s success? MIKE: I enjoy getting an understanding of where a client is coming from, what they want and why, and how we can help their business. We’ve built a culture that values technical excellence, the sharing of code and helping each other, but not at the expense of customer service. Providing what customers want and need is kind of ingrained. NZB: What have been the most significant changes in the web development marketplace since you started? MIKE: It seems like technology moves so fast that it’s impossible to keep up. But, in fact, the fundamentals of the web don’t change much, and having a long-term view helps us focus on which new technologies are valuable for incorporating into our process. User expectations have changed significantly – now people expect a lot of functionality to be built-in and want even complex requirements to be simple. User experience design is critical, and understanding what makes good user experience is one of those fundamentals. We are no longer doing simple websites, as these can be done using DIY tools. But there are still many more complex requirements that need our skills and experience. However, the problem with services businesses is they don’t tend to be very scalable. So instead of keeping on adding bodies, we’re creating a product with global potential in the form of Speaking Email. Many say incubating a product development within a services company is a formula for success, as it avoids the problems associated with taking on outside investment. NZB: How did the Speaking Email app come about? And what’s the story behind the Bosch deal? MIKE: I wanted an app that would read out my email to me while driving to work. It seemed like a good way to make productive use of commuting time. I tried every app available, including Siri, but wasn’t satisfied – so I thought maybe this is a gap waiting to be filled. We made Speaking Email work with all email platforms, and published iPhone and Android versions on the app stores. After a year refining and improving it, I received an email out of the blue from Bosch. They were looking for apps to integrate with their connected car system. The Bosch partnership is a huge deal for us. It means our app may be installed in up to a million cars a year. We have to go through a few more approval stages yet but we are on track. NZB: What is the global potential for Speaking Email? And what are your plans for it? MIKE: Our market is both small and big. Everyone has email. A lot of people drive, or can’t see very well or prefer to have things read to them. So the market could be billions. On the other hand, this market is tiny as it has very small mindshare – people aren’t thinking about it, don’t realise it exists or don’t realise it would be useful. It’s not an established market, so estimates of its potential are pretty useless. I was in LA for the Consumer Electronics Show (CES). Bosch had Speaking Email running on a BMW motorbike. The car manufacturers were all showing off their technology and I chatted to them about third party apps. They’re scrambling to get their platforms right for the connected car of the future. Right now there’s no consistency in the approach to third party apps – what restrictions they have in driving mode, where they are installed (phone or car), or what operating system they run off – let alone standards for how an app interacts within the car environment. But all this will come eventually. Like the PC and mobile phone, the apps will become a key platform. NZB: What inspiration can other young web developers take from your example? Do you have any advice? MIKE: You have to enjoy what you do and see the value in it. Building a business also takes time and requires stickability. I’ve heard people say start-ups are hard. This is true. You need a very good idea that you want to stick with for several years. If you enjoy building the product and can see the potential, then you’re off to a good start. Building Speaking Email within our existing business has made it a lot easier to sustain, but also harder in some ways with the two very different business models. I’m proud of having bootstrapped beweb without any financing. Raising funds can sap a lot of energy from a start-up. Funding is not the end goal, but some people seem to treat it as such. NZB: What’s next for Beweb? How do you maintain that passion and enthusiasm? MIKE: We plan to continue our services business alongside Speaking Email and see where it takes us. We’re focusing our growth on the app and taking opportunities as they come. One of the things I like most about programming is seeing how old technology still works and is continually built on. Speaking Email is an email client that connects with almost every mail server, which has meant learning about all kinds of email technologies. It’s a bit like archaeology, poring over historic systems documentation, and then integrating it with some of the newest features in mobile operating systems, and cars. Visiting Silicon Valley was exciting. As a geek from way back I love all that computer history. I get a kick out of seeing what our team has built, whether it is an app, website or a business system. It’s always exciting to see people enjoy using something you’ve helped build.